View of Gunnersbury Park as it was in the late 18th century. Built between 1658 and 1663 by James Webb, this red-brick mansion was unusual in that it was one of the few 17th-century Palladian mansions with a pedimented first floor loggia ( a gallery room left open on one side). 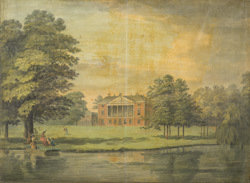 Between 1762 and 1786, it was the summer home of Princess Amelia, an aunt of George III, who tried to improve the gardens and employed William Kent to work here. This house was demolished in 1800/1, the estate split up and the mansion rebuilt.